Please use great caution around white lacy wildflowers! Some are friendly and beautiful (Cow Parsnip), some are beautiful and invasive (Queen Anne's Lace), and some are beautiful and invasive and deadly (the Hemlocks and Giant Hogweed)! Do not touch any of these plants unless you can positively identify them. Keep children and animals away from them. When it comes to white lacy wildflowers, KNOW YOUR PLANTS! The Bad: Queen Anne's Lace (Daucus carota) has a sweet bloom, similar to the Cow Parsnip but much smaller, rarely reaching more than 5 inches across. Each bloom is really a group of clusters of tiny white flowers, each stem has a red heart right in the center of the bloom clusters. While this plant is not poisonous, it is invasive and extremely hard to eradicate due to the strong, deep taproot and the fact that the seeds are much like Velcro and stick to anything that brushes against them. Often they hitchhike in the fur of cats and dogs, sometimes burrowing deep into the pelt until they reach the skin. If left there they usually cause irritation and, ultimately, infection. However, this plant can be kept within bounds by simply picking the flowers! They are lovely when pressed or dried in a medium that will preserve their shape. If you add a few drops of food coloring to their water in a vase, the flowers will become tinted with the color. The Deadly: The Hemlocks--Poison Hemlock, Water Hemlock and Bulbiferous Hemlock (Conium maculatum, Cicuta maculata, Cicuta bulbifera respectively) and Giant Hogweed (Heracleum mantegazzianum) are dangerous as well as invasive. All parts of these plants are extremely poisonous. The differences between them are shown below in the comparison chart. If plant is identified as one of the Hemlocks or Giant Hogweed, take care not to allow any part to touch skin and do not breath the pollen. Cover face and arms completely, wear gloves and dig or pull entire plant. Place immediately in plastic bags, tie securely closed and put into garbage can. Do not compost. Even dried, hemlock retains it's poisonous properties. 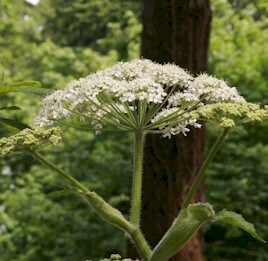 In case of suspected Hemlock or Giant Hogweed poisoning, contact a poison control center and obtain emergency medical assistance as quickly as possible. Poisoning may result in severe seizures and convulsions that must be controlled to preserve normal ventilation and cardiovascular function. Death can occur in as little as 15 minutes after ingesting even a small part of the plant. Distri-bution Originally from Europe, now considered native to Northwestern United States, but found all across United States and Canada. Native to Europe, now found all across United States and Canada. Native to Europe but now widely distributed across US, especially Northern states. Throughout British Columbia, Western to Central United States and into New England. Native to central Asia, confirmed in Massachusetts, New York, Pennsylvania, Oregon and Washington State. Reported in Maine, Michigan and Washington DC but not yet confirmed. Natural Habitat Meadows, along streams, roadsides Dry meadows, roadsides, uncultivated places Dry meadows, roadsides, hiking trails, ditches, uncultivated or waste places Wet seepage, swampy areas, pastures, meadows, along streams May show up anywhere but most common along roadsides, vacant lots, streams and rivers. Perennial, from 4 - 10 feet tall (taller in shade). Biennial, second year grows 2-4 feet high. Biennial or perennial, 6 - 10 feet tall. First year forms large rosette, second year produces stems and flowers. Disagreeable, mouse-like odor. A wetland plant, it starts growing in spring. Grows in small patches. Biennial or perennial, 8 - 20 feet tall. Some plants die after flowering, some flower for years. Sprout late winter to early spring from roots or seed. Large 1- 1 1/2 feet across, serrated, palmately compound, radiating at the end of the stalk in a semicircle. Finely divided, feathery, matte, covered with short coarse hairs. Divided, fern-like, shiny. Large, up to 12 inches long and 4 inches wide, alternately arranged on stem, dividing 3-4 times. Closely resembles parsley or wild carrot except hemlock has no hairs on the leaves and stems..
Alternate, compound, toothed. Oval leaflets with saw-toothed margins. Veins end at base of the notch on leaf edge. Huge compound leaves (up to 5 feet in width), deeply incised. Hairs on underside of leaves are stiff, dense and stubby. Stems Stout, ridged with thorns along the length Stout, hairy, erect and branched. Smooth, hollow, purple-mottled, much branched. Smooth, purple-striped or mottled, hollow except for partitions where root and stem join, filled with yellow, oily liquid smells like parsnips Hollow, 2-4 inches in diameter with dark reddish-purple splotches and coarse white hairs. Roots Large fleshy taproot Woody, hairy, cream-colored, large taproot Fleshy white taproot, Smooth, purple-mottled skin. Odor similar to carrots or parsnips. Branching, tuberous roots similar to dahlia. Thick, fleshy with a large number of chambers holding the yellow, oily liquid. Usually has taproot, occasionally fibrous root. White lacy clusters of small flowers branching off main stem. Blooms June or July in higher elevations. Large umbrella-shaped white clusters are about 2 1/2 feet in diameter, numerous small flowers making up the cluster. Blooms mid-May through July. White, lacy, flat-topped cluster nearly 1 foot across. Blooms in May. White, lacy, densely arrayed, up to 5 inches across with single deep red "heart" blossom at center. Blooms May - October. Blooms June to August. White lacy clusters branching off main stem, loosely arranged. Seeds Seed head hold shape of flowers. Seeds are flat disks, slightly fringed around edges, up to 1/4 inch long. Seed head is cup-shaped, seeds are covered with bristles which readily hitch-hike on passersby, thereby spreading the plants. Seed head holds shape of flowers, seeds ripen in August and September. Paired, light brown to grayish green, about 1/8 inch in length. barrel-shaped, ribbed. Seed head holds shape of flowers. Seeds are dry and in two-part capsule. Seed head holds shape of flowers. Seeds are flat, 3/8 inch long, oval seeds with broadly rounded base and ridges. Poisonous See note below. Yes, can cause dermatitis reaction which is aggravated by exposure to sun! Yes, all parts can be deadly! Seeds contain highest concentration of poison, are often mistaken for caraway. Can cause toxic reactions when inhaled. Human deaths have occurred from consuming roots, being mistaken for wild carrots or parsnips. In ancient Greece, it was used to poison political prisoners. Socrates drank the poisonous juice to commit suicide. Native Americans once used hemlock to poison tips of arrows. Yes, all parts can be deadly! Contact poison control center and obtain emergency medical assistance as soon as possible. Poisoning shows severe seizures and convulsions. Yes, classed as public health hazard. Clear watery sap has toxins that cause photo dermatitis. Skin contact followed by exposure to sunlight produces painful, burning blisters that may leave purple or black scars. Eye contact can cause temporary or permanent blindness. CAUTION: The 'juice' from Cow Parsnip leaves and stems may sensitize the skin so that it is very easily sunburned. Washing off the juice and wearing long sleeves for a few days apparently is the ticket after exposure. The umbilliferae of Cow Parsnip (Heracleum lanatum) contain furano-coumarins which, when exposed to sunlight, cause significant photo-toxic reactions (photosensitivity). One of the more common skin reactions to Cow parsnip, is the ‘weed eaters’ or ‘strimmers’ dermatitis. When string trimmers are used to clear long grass, components of weeds are usually mulched and scattered in all directions, often coating the legs and arms of the operator. The sap of the plants then gets on the skin, and, when exposed to sunlight, gives rise to a very characteristic rash which may be severe and persist for many months.